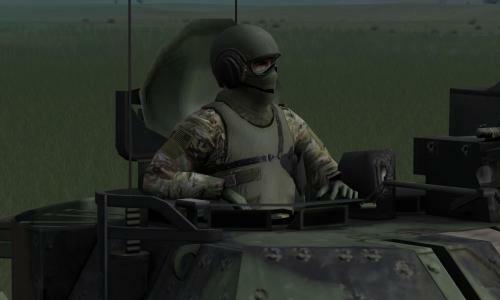 Skins for the 3D vehicle Crewman and Infantry including its support weapons. 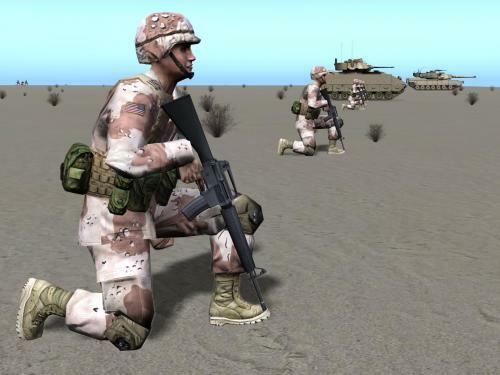 The Desert Battle Dress Uniform (DBDU) is a U.S. arid-environment camouflage battle uniform that was used by the United States Armed Forces from the early 1980s to the early to mid 1990s, most notably during the Persian Gulf War. Although the U.S. military has long since abandoned the pattern, it is still in widespread use by militaries across the world as of the early 2010s. Although the chocolate-chip camouflage became well known during the Persian Gulf War, it was originally designed decades prior, in 1962. The U.S. Army, believing that it might one day become necessary to intervene in the Arab–Israeli conflicts, developed a test pattern using the deserts of southwestern United States as a model. When the hostilities in the Middle East wound down, the test pattern was mothballed. The formation of the U.S. Rapid Deployment Force (RDF) in 1979, with its remit to operate in the Middle East, and protect U.S. interests in the Persian Gulf region, saw the need for desert camouflage clothing to emerge again. WARNING-Back up your original DDS files. Be familiar with the file structures in SB ProPE. Suggested reading the manual starts page 15 under “File Structure” through page 18. 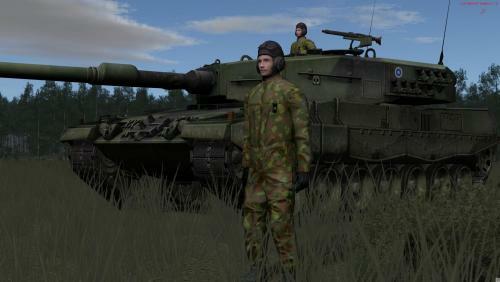 Updated and improved "Auscam" woodland and desert uniforms (DPCU and DPDU) for Australian Defense Forces. 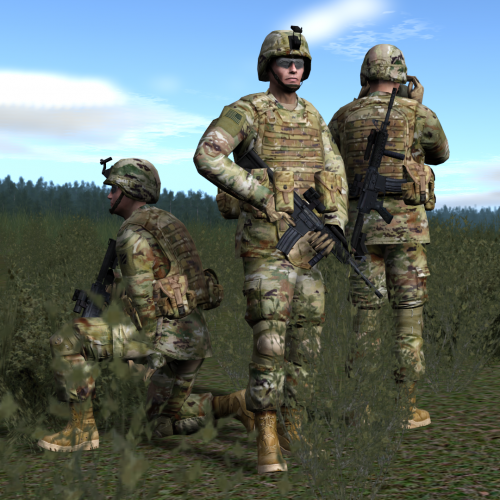 This package includes Infantry and Armor Crewman uniforms, equipment, and alternate face/glove files. 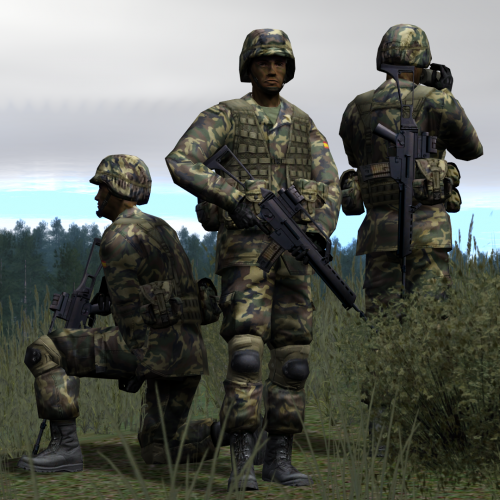 This is not my original artwork, but rather minor edits to fix graphical issues where the default Spanish skins use the "interceptordress" template but the sim uses the "usmolle" model for Spanish infantry. Removed are the groin protector and the extraneous shadow of the nightvision helmet mount, neither of which is included on the usmolle model. 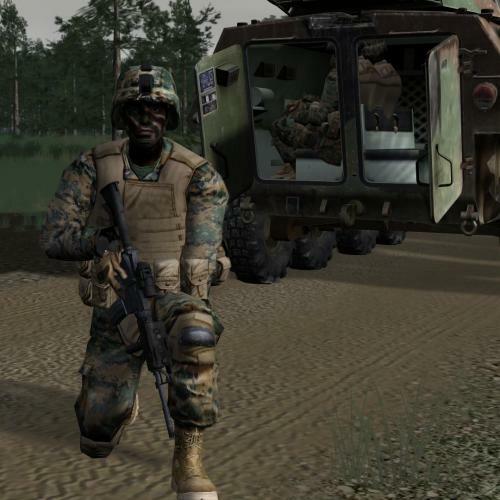 Not fixed is the normal map, so the molle webbing remains superimposed on the body armor. The body armor, which is represented graphically only, does not impart additional ballistic protection to the model. 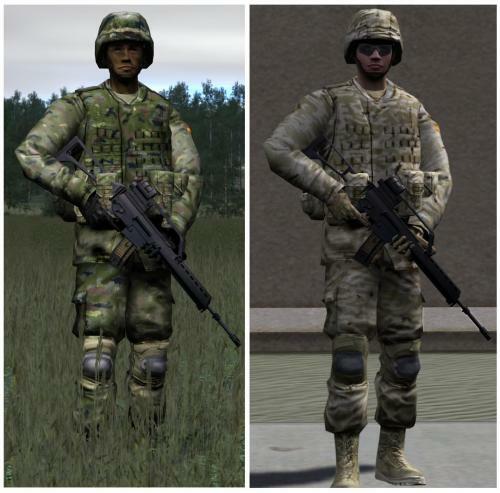 Included are optional "face2" skins simulating eyewear (desert) and alternative face camo (woodland). 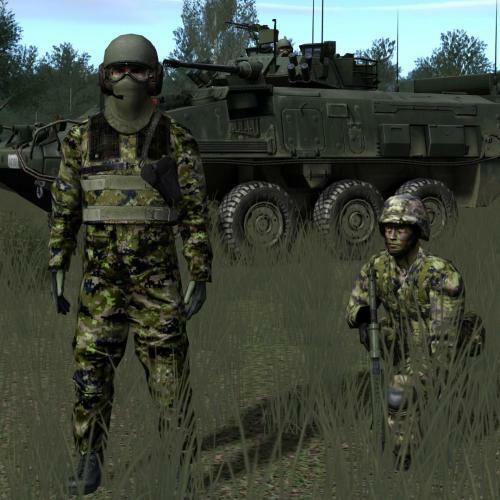 This infantry skin and AFV crewman skin use the woodland camouflage worn by Spanish troops prior to the adoption of the current "digital" multicam pattern. 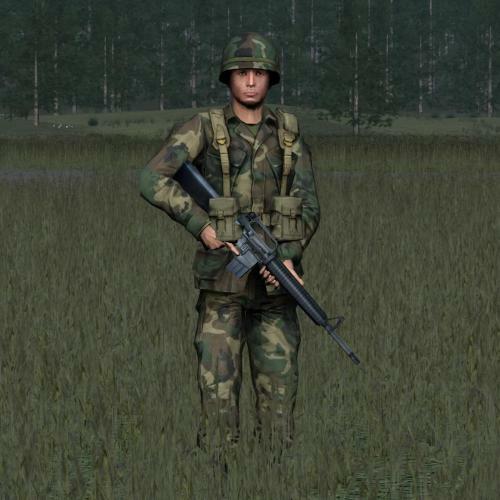 This skin represents a period of transition in the early 1980s where the U.S. Army adopted M81 Woodland camouflage BDUs for possible combat in Western Europe but had not yet fully replaced the M1 "steel pot" helmet with the new Kevlar. Soviet Naval Infantry circa 1990. 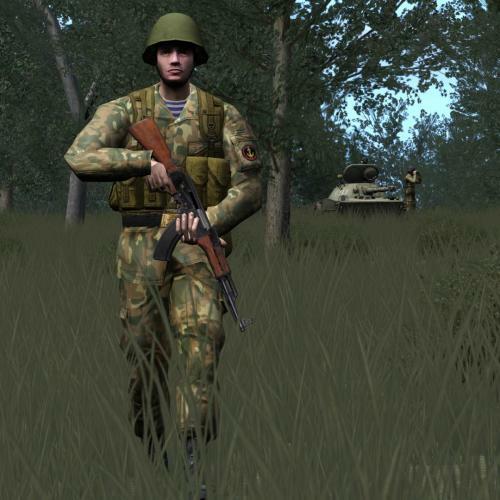 Package includes Infantry and AFV crew uniforms in TTsKO (tryokhtsvetnaya kamuflirovannaya odezdha -- three color camouflage). 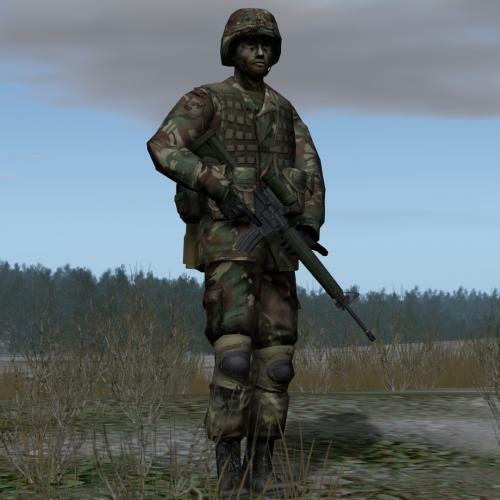 A U.S. infantryman uniformed in the Army's current multicam, Operational Camouflage Pattern. Alternative face camouflage for British troops. This AFV crewman wears M/84 camouflage, a flecktarn-style pattern in use from the mid-80s until replaced over the past few years with a multicam pattern. 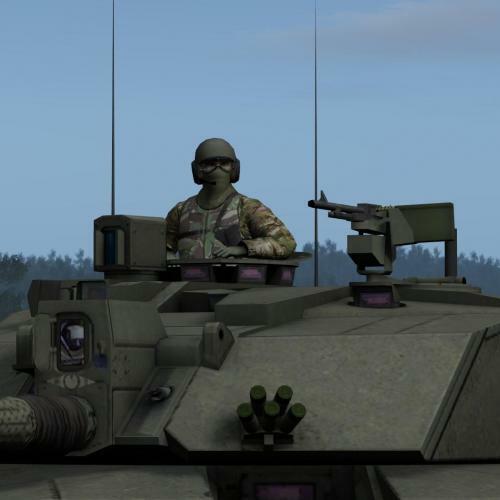 The skin uses the UStanker crew model rather than the default DEtanker, so the mission-maker must "set look of crew" for the appropriate vehicles. Readme instructions included. Offered to the community in the interest of adding to the immersion of Panzer_Leader's fine scenarios. 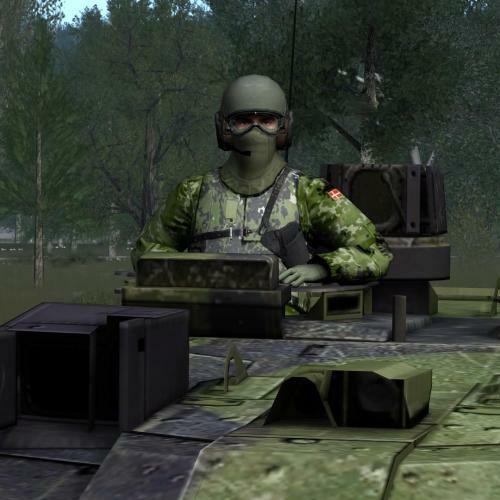 An AFV crewman in woodland CADPAT similar to dejawolf's default Canadian infantry in SB4. This package contains two options for AFV crewmen of the Finnish Defense Forces wearing M/05 Woodland camouflage, the current camo pattern in use by the FDF. They display the Lagus' arrows patch of the Armour Brigade. On one, I have tried to represent -- within the model's limitations -- the M/05 flak vest and a cloth-covered composite shell over his headgear. The other depicts the same two-piece uniform with the body armor under the blouse -- to prevent catching inside the tank -- and the covered shell removed from the headgear, as they are frequently worn. The second version (standing) requires the user to "set look of crew" in the mission editor. Readme instructions included. Special thanks to Zipuli for reference material and guidance. This AFV crewman of the Finnish Defense Forces wears coveralls in M/91 camouflage, appropriate for the 1990s and early 2000s. Special thanks to Zipuli for references and guidance. 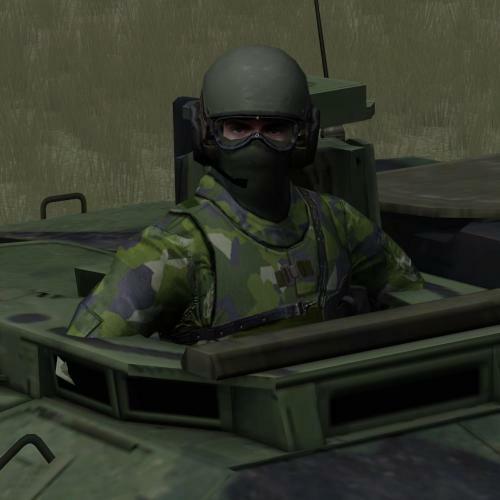 IMPORTANT: Because this texture uses the DEtanker crew model, to see it in-game you must "set the look" of your AFV crews in the Mission Editor. Readme instructions included. This package contains two patterns of M/62 camouflage, appropriate for Finland armor crews from the 1960s through the turn of the century. IMPORTANT: To see this texture in-game, you must set the look of your vehicle crews in the Mission Editor. Readme instructions included. 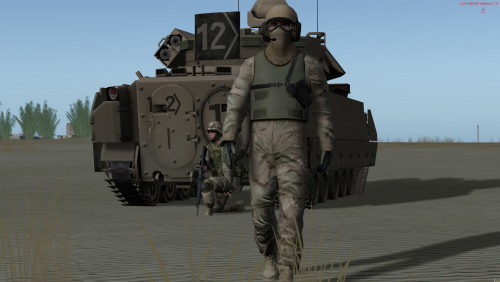 Enclosed are two (2) camouflage patterns for British armour crews -- the contemporary Multi-Terrain Pattern (MTP multicam), and its predecessor Disruptive Pattern Material (DPM) -- both sporting some well-traveled body armor in DPM. An armor crewman wearing the U.S. Army's current Operational Camouflage Pattern (OCP). 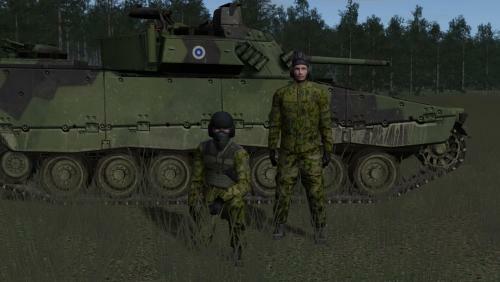 This tank crewman has traded his eSim-issued green uniform for Sweden's M/90 camouflage. This AFV crewman wears the DPDU (Disruptive Pattern Desert Uniform) of the Australian Army. 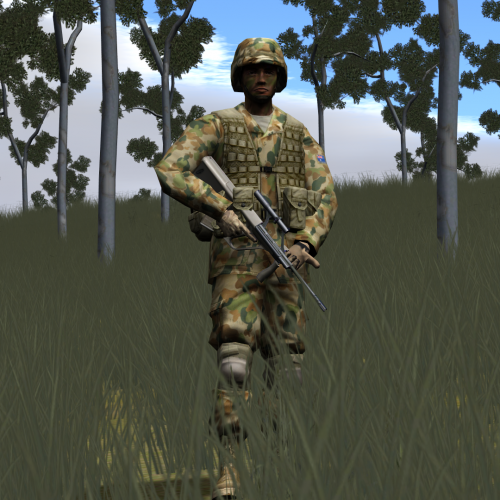 This AFV crewman wears the DPCU (Disruptive Pattern Camouflage Uniform) of the Australian Army, also known as AUSCAM. This AFV crewman wears the three-color DCU (Desert Combat Uniform) of the United States Army. 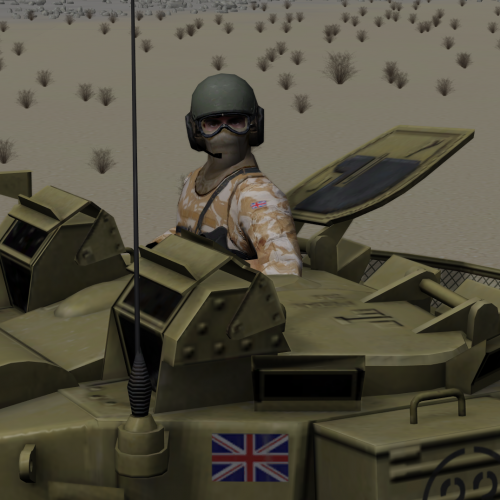 This AFV crewman wears the Desert DPM (Disruptive Pattern Material) uniform of the British Army. 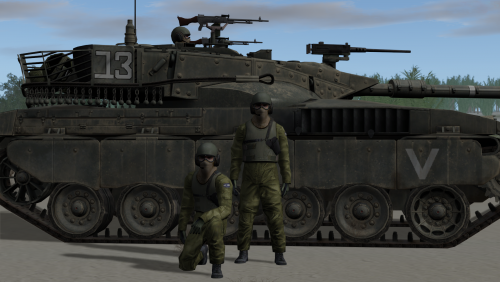 This mod changes your Israeli AFV crews from the sim's Russian model to the US model dressed in olive IDF uniforms, complete with CVC helmet. Important Readme included. 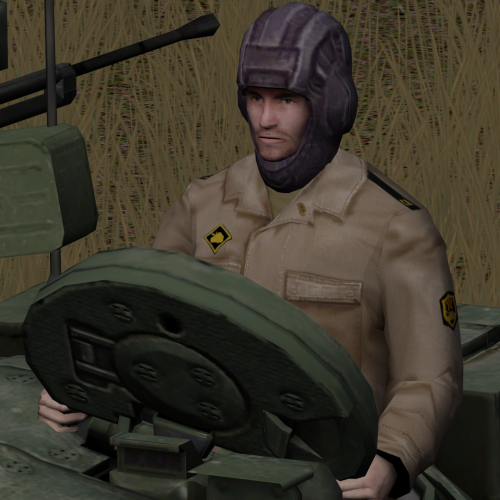 An alternate uniform skin for Soviet-era tank crews. For versions 4.0 and later. This is a USTanker skin in Universal Camouflage Pattern (Digital) to match the stock U.S. infantry in Steel Beasts Pro PE 4.0 and above. 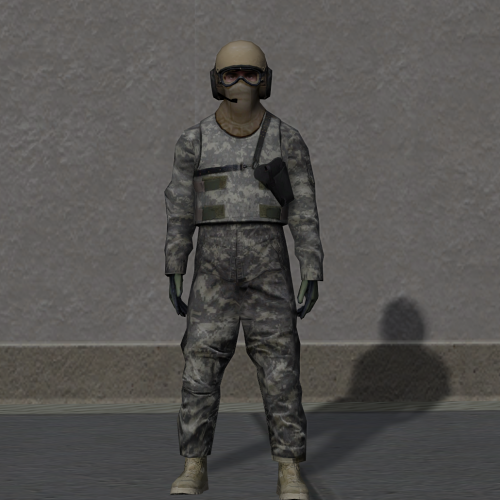 Included are a skin for desert environments (with Tan CVC and balaclava) and a bonus one in the standard green. 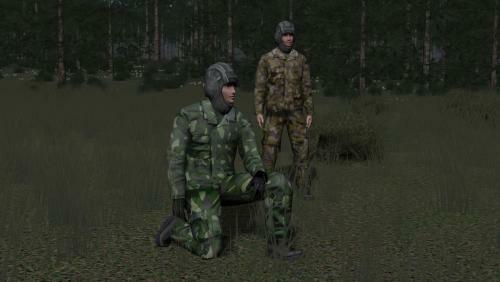 A new woodland camouflage uniform for Netherlands infantry forces. The skin includes a subdued flag patch and NATO Response Force patch.